Vibration-controlled transient elastography (VCTE) with FibroScan can provide an accurate assessment of liver fibrosis in patients with chronic viral hepatitis, but operator-related and patient-related factors affect measurements, report 2 articles published in the April issue of Clinical Gastroenterology and Hepatology. The lowest levels of variation occur in patients with no or early-stage fibrosis, or when the procedure is performed by a single experienced operator, the studies show. It is important to determine the level of fibrosis in patients with chronic liver diseases, including nonalcoholic steatohepatitis (NASH), to evaluate disease progression. Until recently, liver disease progression could only be monitored by collection of biopsies and histologic analyses. However, liver biopsies provide information about only a small part of the liver, and are uncomfortable and even dangerous for patients. VCTE with FibroScan (Echosens; Paris, France) transmits a vibration at low frequency to induce an elastic shear wave; the velocity of the wave propagation can be measured and directly relates to the tissue stiffness. VCTE acquires information from about 100-fold more sample tissue than a liver biopsy. Furthermore, the procedure is rapid, noninvasive, and can be performed at the bedside, providing the physician with immediate information for patients. Findings from VCTE are generally considered to be reproducible. Fabio Nascimbeni et al investigated short-term variations in stiffness measurements. They performed a retrospective analysis of 531 paired liver stiffness measurements, taken from 1 day to 1 y apart, from 432 stable patients with chronic liver disease. Nascimbeni et al found more than 20% variation in 49.7% of paired measurements, more than 30% variation in 34.3% of paired measurements, and more than 50% variation in 12.2% of paired measurements, across the range of liver stiffness values (see figure). Variability according to maximum ratio of interquartile range:median (IQR/M) between paired measurements of liver stiffness. 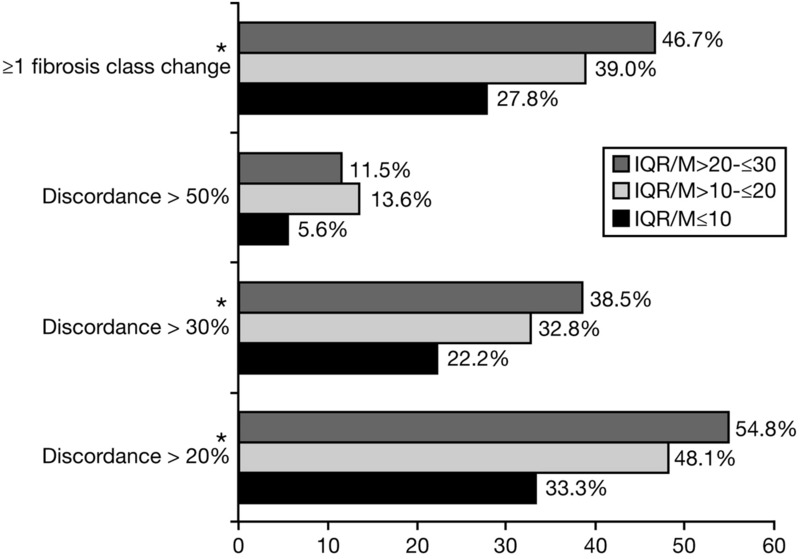 *χ2 P for trend 20%, >30%, and ≥1 fibrosis class change. The variations produced a 1-fibrosis stage difference in 31.5% of pairs and a 2-stage difference or more in 9.8% of pairs. Factors associated with variation included measurements made by 2 different operators (or at least 1 non-senior operator), ratios of interquartile range:median values, significant fibrosis (≥7 kPa) at the first liver stiffness measurement, body mass index, or a 2-fold difference in level of alanine aminotransferase between measurements. When the analyses were restricted to measurements made by the same operator, the variation was slightly reduced; fibrosis stage differed between measurements for only 34.3% of cases. The authors conclude that measurements of fibrosis by FibroScan can be altered by factors unrelated to disease progression, but instead associated the operator or patient. The lowest variability was seen in patients with no/early fibrosis and when VCTE was performed by a single experienced operator. In a separate, prospective study, Nezam H. Afdhal et al compared findings from biopsies with those from FibroScan to determine what levels of liver stiffness could identify patients with chronic viral hepatitis and significant fibrosis, advanced fibrosis, or cirrhosis. In a 2-part study, Afdhal et al found that FibroScan identified patients ≥F2 fibrosis with an area under the receiver operating characteristic curve (AUROC) of 0.89, and identified patients with F4 fibrosis with an AUROC value of 0.92. They found cutoff values that identified patients with F2 fibrosis with 58%–82% sensitivity and 75%−79% specificity, and F4 fibrosis with 76%–84% sensitivity and 85%−86% specificity. Afdahl et al reported VCTE to have an inter-observer agreement correlation coefficient of 0.98 (n = 26) and an intra-observer agreement correlation coefficient of 0.95 (n = 34). An editorial by Raj Vuppalanchi and Arun J. Sanyal says intra-reporter and inter-reporter variations in the assessment of fibrosis can result from differences in periods of fasting before analysis or positioning of the subject or the probe. The editorialists describe other factors that can affect VCTE measurements, including changes in hepatic fat content, hepatic congestion caused by heart disease, and other disorders. FibroScan was only recently was approved by the US Food and Drug Administration for “noninvasive measurement of shear wave speed in the liver”. The FDA requires operators to undergo course training and perform a minimum of 10 cases under supervision before using the device independently. Vuppalanchi and Sanyal add that it is important to maximize the amount of liver analyzed and avoid the lower edge of the liver. For patients likely to undergo multiple measurements, the location of probe placement should be recorded, so that further measurements can be made in the same region. Furthermore, the median and interquartile range of results must be reported; every attempt should be made to keep the variance in VCTE measurements to a minimum (ideally under 10%). The editorialists conclude that complete information on patients’ medical history, results from imaging studies, and laboratory test results are all required to completely interpret liver stiffness measurements, with selective use of liver biopsies to confirm diagnoses. What Complications Can Arise From Percutaneous Liver Biopsy? How to Get Rid of H pylori Infection—And do we Need to? I too recently had a FibroScan and had a similar experience. This was at Jewish Hospital Louisville Ky. The operator stated she had been with the office only a few months and was unsure if the transducer was relaying or retrieving as it should. After several ‘thumps” from the transducer she decided to go get a nurse practitioner with the office. They then placed it in a different spot and continued. The NP was a little patronizing about the whole procedure. The operator was trying her best. I came away feeling very unsure about the results I may get and very uninformed. I questioned the NP and she seemed to brush everything aside. The clinic should realize this is important to patients. After reading this and other articles I’m feeling very unsure. Haven’t got my results yet. A fibrosure blood test said I have cirrhosis. The clinic should realize this is serious for patients.